Hibs midfielder John McGinn admits he has Rangers in his sights after seeing his shooting practice pay-off. The Scotland Under-21 internationalist credited his stunning opening goal in last Saturday’s 3-0 victory over Raith Rovers to assistant manager Andy Holden after revealing how he has been doing extra work on his finishing with ‘Taff’ in training. The former St Mirren player’s 20-yard effort was only his second goal of the season, his first coming in September’s 3-0 win of Alloa. McGinn will now have no hesitation in shooting on sight when Rangers visit in Sunday’s crucial top of the table Championship clash. McGinn said: “I’ve been working with Taff in training and he has been telling me that I have it in my locker, I just need to angle it a wee bit better. “Credit for the goal goes to him. “I’m chuffed but I’m more chuffed that we managed to get the win. It was a really important week for us and hopefully we can use the nine points that we gained and take it into Sunday. 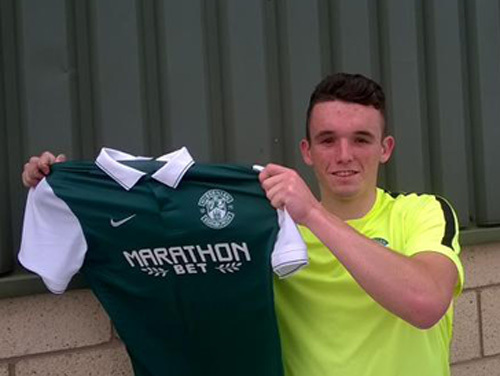 McGinn, who has made a total of 13 appearances since joining the Leith outfit on a four-year deal at the tail end of July, added: “I’m loving it at Hibs, I’m really enjoying my football.